Gold More Productive Than Cash?! Is gold, often scoffed at as being an unproductive asset, more productive than cash? If so, what does it mean for asset allocation? There are investors that stay away from investing in gold because it is an 'unproductive' asset: the argument points out gold doesn't have an intrinsic return, it doesn't pay a dividend. Some go as far as arguing investing in gold isn't patriotic because it suggests an investor prefers to buy something unproductive rather than investing into a real business. In many ways, it is intriguing that a shiny piece of precious metal raises emotions; today, we explore why that is the case. Each investor has their own preference in determining asset and sector allocations. Some investors prefer to stay away from the tobacco, defense or fossil fuel industry. During times of war, countries have issued bonds calling upon the patriotism of citizens to support the cause. At its core, however, investing, in our assessment, boils down to returns; more specifically, risk-adjusted returns. The "best" company in the world may not be worth investing in if its price is too high. Similarly, there may be lots of value in a beaten down company leading to statements suggesting profitable investments may be found "when there's blood on the street." Gold is not only unproductive, but has a storage cost and is expensive to insure. So what could possibly be attractive about gold? We wonder where all these patriotic investors are hiding. That's because if we look at long-term yields, they are near historic lows throughout the developed world, with many countries showing near zero or even negative yields on governments bonds. Differently said, many investors rather get a negative yield on the safest investments available to local investors (disclaimer: U.S. regulatory point of view, foreign government bonds aren't considered "safe") than invest in so-called productive assets: a corporate bond may qualify as a 'productive asset' if a company uses the proceeds to invest in future ventures; yet, in today's environment, corporations frequently issue bonds to buy back shares. Why do investors prefer "nothing" – as in no or negative returns – over investing in productive assets? 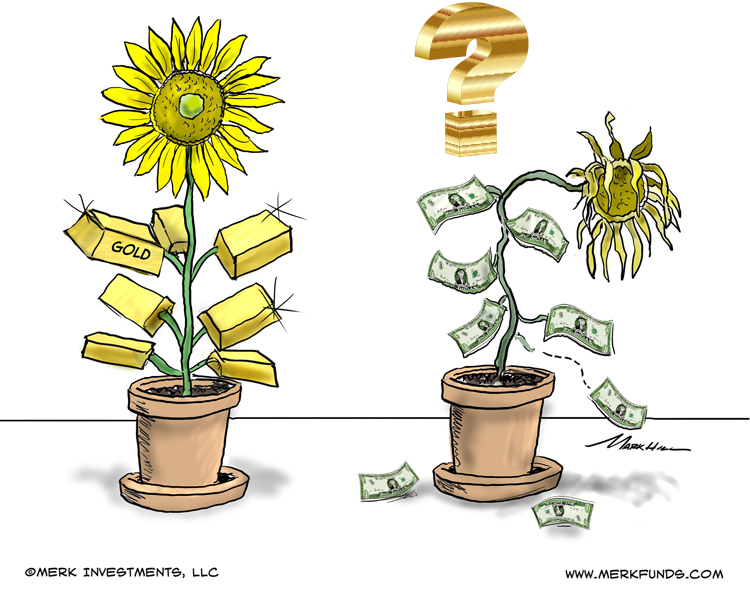 And if investors really like negative returns, is gold – that doesn't have an intrinsic return – suddenly attractive? On April 7, Fed Chair Yellen joined an "International House" panel with all living former Fed Chairs: Bernanke, Greenspan and Volcker. When Bernanke was asked whether we need more fiscal stimulus as monetary policy may have reached its limits, we interpreted Bernanke's long-winded answer as agreeing to the basic notion that it would be helpful to ramp up fiscal spending. Little coverage was given to Greenspan's response: "No!" Focusing on the U.S., he said unemployment is close to what's historically considered full employment: if fiscal spending were to be ramped up, we might get a short-term bump in growth due to the induced government spending, but we would foremost get wage inflation and increased deficits that will come back to haunt us. Instead, he argued, we need policies that increase productivity: when you are near full employment, the way you grow an economy is to increase the output per worker. He suggested the best way to increase productivity is to encourage investments. While we acknowledge that not everyone agrees with Greenspan's policies over the years, we believe he is dead right on this one. So why the heck aren't investors investing? Why are they buying bonds yielding just about nothing? There may be many reasons why investors are on strike. Current low inflation, in our view, is a symptom, not a cause of that. At its core, we believe investors don't think they get rewarded for their risky investments. Our analysis shows that investors in recent decades have – on average – focused on ever more short-term projects. That is, projects that require massive investments with an expected return in twenty years rarely happen these days. Regulatory risks. We allege regulatory burdens have substantially increased in many industries. This increases the barriers to entry (stifling innovation), as only large players can afford to comply with the rules. If we take the U.S., gridlock in Congress, has caused regulatory agencies to increasingly change the path of regulations without legislative process. The cost of doing business has gone up in many industries, from finance to pharmaceuticals to energy, to name a few. Government debt. We allege investments are at risk when governments have too much debt. That's because the interests of a government in debt is not aligned with the interests of savers. A government in debt may be tempted to induce inflation, increase taxation or outright expropriate wealth. In our assessment, investors need to be convinced government deficits are sustainable for them to have an incentive to invest. Neither government deficits nor regulations are new phenomena, of course. But we believe it's concerns over trends like these that are key to holding back investments. It's often argued that the U.S. can print its own money and, as a result, will never default. Possibly, but that doesn't mean the U.S. won't induce inflation or find other ways to tax investors. And while there are solutions to any problem, investors must be convinced that those that benefit risk takers will be embraced. Eurogroup chief Dijsselbloem, at the peak of the Eurozone debt crisis phrased it well, arguing that we cannot expect long-term investments if we don't tell people where we want to be in ten years from now. While a crisis is apparent when Greek government bonds rattle global financial markets, the global strike by investors to invest in productive assets may be just as alarming. But aren't demographics at least partially to blame for the low rates? It cannot be entirely a view about fiscal deficits and regulations? Sure enough, we agree that demographics put downward pressure on real rates of return. Yet, we see this as part of the same issue: we could introduce policies that encourage workers to be productive longer rather than retire at age 65. Instead, we have policies in place that have enabled many to go into early retirement by claiming disability benefits. With increased life expectancies throughout the world, we feel retirement at age 65 has become a major fiscal burden. Is gold now good or bad? We may be pushing the can down the road. A belief that policies in place have not put us on a sustainable fiscal path. Concerns of ballooning entitlement obligations come to mind. Namely, we are pushing the can down the road. Importantly, we don't see a change in that trend for some time, if at all. Regulatory uncertainty is only increasing. Regulations are strangling businesses, discouraging investments. Recent government deficits have been improving; folks have always complained about the long-term outlook, but when push comes to shove, politicians will find solutions. Both small and big business have always complained about regulation, there's little new here. Phrasing it this way, it's not a surprise that an investment in gold often has a political dimension. We caution, however, that gold is anything but political. As such, it may be hazardous to one's wealth to make investment decisions based one's political conviction. Instead, investors may want to take a step back and acknowledge that investors in the aggregate give a thumbs down to investments as evidenced by the low to negative long-term yields in the U.S. and other countries. Before we settle the discussion on gold being 'unproductive,' let's clarify that cash isn't productive either: the twenty-dollar bill in your pocket won't earn you any interest either. To make cash productive, you need to put it at risk, if only to deposit it at a bank. With FDIC insurance or similar, such risk might be mitigated for smaller deposits. Gold is no different in that regard: to earn interest on gold, one needs to lend it to someone. Many jewelers are only leasing the gold until they find a buyer for the finished product; to make this happen, someone else is earning interest providing a loan in gold. Many of today's investors don't like to loan their gold, concerned about the counter-party risk it creates. The price such investors pay is that they don't earn interest on their gold, a price those investors think is well worth paying. Gold more productive than cash? The reason we started this discussion wondering whether gold may be more productive than cash also relates to the fact that real rates of return on cash, i.e. those net of inflation, may be negative in parts of the world. There are many measures of inflation and some argue that government statistics under-represent actual inflation. As such, each investor might have his or her own assessment where inflation may be. However, when real rates of return on cash are negative, it may be appropriate to say gold is more productive than cash. In summary, anyone who thinks that we are heading back to what might be considered a 'normal' economy, might be less inclined to hold gold, except if such a person believes that the transition to such a normal economy might be a bumpy ride for investors (due to the low correlation of the price of gold to equities and other assets, it may still be a good diversifier in such a scenario). However, anyone who thinks history repeats itself in the sense that governments over time spend too much money or over-regulate, might want to have a closer look at gold. There may well be a reason why gold is the constant while governments come and go.